A historic industry, retail is one of the country’s biggest sectors and is a major contributor to the economy, with around three million people currently employed in retail in the UK. 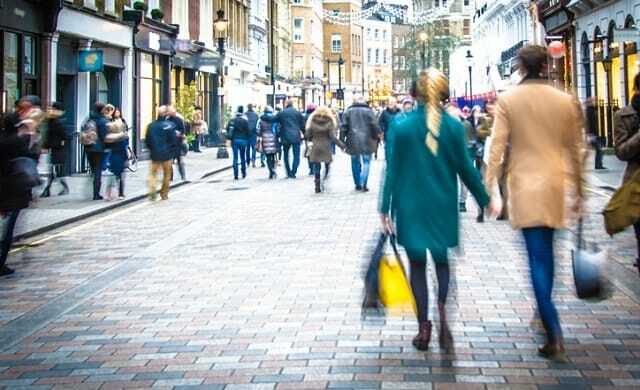 “Consumers are becoming more conscious and wary of their spending habits, and so have become much more frugal with their disposable income, and Brexit has certainly caused uncertainty for retailers. It’s difficult to miss the results of this, with news outlets frequently reporting that another retail giant has returned troubling figures or even closed down. But there are opportunities to succeed. With nationwide campaigns such as Small Business Saturday encouraging customers to shop with their local independents, the market has seen a resurgence of smaller shops. It’s arguable that UK consumers are now more aware than ever of the role they can play in helping independent retailers succeed. In this vein, Karen Whybro, owner of Rock the Frock bridal boutique, says: “Retail is doing fine if you’re offering something different or unique to the customer. You can no longer just open the doors of a shop and wait for droves of customers to pour in. In order to make it in this tough market – fighting off competition from large well-established brands and online platforms offering bargain prices – you’ll need to remain resilient, adaptable, passionate and customer-focused. Still keen to open a shop? Read on for our comprehensive guide to launching a retail business. One of the earliest decisions to make when starting a shop is choosing what to sell; you’ll increase your chances of surviving in the highly competitive retail space if you can carve your own niche. If you’re going to be ordering your stock from a supplier, try to go with a product that you like, use yourself, or otherwise understand. You’ll struggle to pick out best-selling clothing, for example, if you don’t know much about fashion. You’ll want to carry out some research into your product – what sells well and what doesn’t? Are there any current trends you can stock up on? On the flip side, you might want to sell your own hand-designed, handmade products. If you haven’t already received interest in them, first test the market by taking your product to fetes and markets, setting up social media channels on which to show them off, spreading the word among your network and in your area, consulting focus groups and monitoring how much pickup you get before committing to a shop. You’ll also need to ensure that you have the capacity to create enough of your products to fill a shop and keep up with sales. This will likely mean looking into outsourcing your production (if you don’t already). *DVDs, CDs and video games sales are now mostly the domain of internet platforms, but recent years have seen a comeback in vintage products appearing in high street shops. The retail industry is now more diverse than ever; opportunities for consumers to shop appear almost everywhere, from the streets to our smartphones. So, when it comes to starting a retail business, there are a few routes to explore. Brick-and-mortar shops – The shops you see lining streets and shopping centres, these are the traditional retail business where customers are served face-to-face in a premises that the shop owner has bought or rents long-term. The majority of this guide will deal with setting up this kind of shop. Pop-up shops – These are temporary stores which ‘pop up’ in rentable venues, staying there for anything from a few hours to several months. An excellent way to test demand for your product in different areas before committing to a certain location, pop-up spaces can be found in shopping centres, transport hubs, event venues and more. E-commerce platforms – If you’re looking for an option with significantly lower overheads, you may want to consider selling your products through a purpose-built website or, for an even cheaper option, through a platform such as Amazon, eBay or Etsy. But remember, while selling through a site like Amazon will give you potential access to hundreds of thousands more customers, the sheer amount of products available on these sites can make it difficult for new sellers to cut through the noise and get noticed. Market stalls – Well-suited to food, drinks, hand-made products and gifts, market stalls can be found in both permanent street or indoor markets and pop-up events like Christmas markets and craft fairs. If you choose to launch a bricks-and-mortar retail business then you won’t be able to succeed without regular customers. This ebook shows you how to attract customers to your store and increase footfall. Alongside defining what you’re selling (and how), you’ll also need to gain a clear understanding of your target audience: the demographic you want to buy your products. Who your target audience are will inform your branding, your business plan, your pricing, your marketing and more, so it’s important that you understand who they are, what appeals to them, what they engage with, where they shop, and how much they tend to spend. Read our free guide to analysing your target market for more. Now it’s time for the fun part – naming your shop. The shop’s name will form the foundation of your business’ identity and it’s important that you’re proud to share it far and wide, so strive to pick something that means something to you. Moreover, your shop’s name will usually be the first point of contact between you and your customers; the first thing they hear when they learn about you. So it’s equally important that your business’ name also resonates with your target audience. What are good shop names? Be easy to read, spell and pronounce. Be memorable to your target customers. Be original. Differentiate your store from others selling similar goods by avoiding anything similar to their names, and steer clear of nationally-popular brand names, whether they deal in similar products or not. Reflect the tone of the business. Is your shop quirky or high-end? Should your name make customers chuckle or denote exclusive luxury? What are your shop’s USPs – what makes it special? Do you have a favourite saying, word or expression? Can this be modified into a business name? Can your own name (or nickname) or the name of someone you love be incorporated? Can town or street names taken from your local area be used? What are some of your favourite products? For example, if you’re a florist and your favourite flowers are lilies, might they form part of your brand’s name? According to McIntosh, a shop name should be “something new that will engage and resonate with the profile of your audience. For new retail businesses, branding is an important consideration. It’s not just a case of what your logo looks like: your branding should feed into every customer-facing aspect of your business. Effectively, your branding is the common thread that ties together your shop’s name, your business’ logo, the shop’s interior design, the tone of voice you use when communicating with and advertising to customers, the way the shop’s website looks and navigates, and the posts you share on social media – making all of these facets recognisable as a part of your business. Communicate the personality of your business. Whether you’re a haughty high-end jeweller or a fun-loving chocolate shop, your branding should make your tone obvious. Represent the preferences of your target audience. Which colours, imagery and communication styles tend to resonate with and draw attention from them? Promise a good quality product and shopping experience. There’s a balance to be struck here – it’s perfectly okay to take inspiration from what’s working well for competitors, but you should avoid doing something overtly similar – after all, it’s crucial that you stand out from them (and avoid the wrath of their legal team). Think of the example set by UK supermarkets – dark blue is instantly recognisable as Tesco branding, as is orange for Sainsbury’s, yellow for Morrisons and green for ASDA. However, many have recognised the same value in advertising low prices in their slogans – Sainsbury’s is ‘Live well for less’ while Tesco’s is ‘Every little helps’. While each store has its own distinct colour scheme and messaging style, they have all capitalised on the one thing that is most important to the majority supermarket shoppers. Speak to people from your target audience and run your ideas past them to see what they think. If you’ve a little extra cash, try running a focus group or an online survey to see which of your ideas resonate most successfully with your ideal customers. Consider your USPs and create a brand statement around the most prominent – for example, ‘our shoes are the most unique on the high street’ or ‘we sell the most affordable premium homeware you can buy’. Try to base your branding around these and have them flow through everything you do. Jake Hardy, founder and owner of Brick Lane clothing store Number Six, adds: “You need to make sure the same passion that has driven you to start the business comes through in your branding. Don’t worry about having everything set in stone straight away. It’ll likely take a bit of practice to get everything you do to fit with your brand’s voice, and besides, branding often evolves over time as the business matures. Interior design and layout is something that you’ll want to put a lot of thought into, and the colours and decorative items that you select should consistently reflect your wider branding concept. Studies have shown that when people enter a shop, they tend to turn to the right. Reflect this in the way that you lay out your shop, starting a walkway from there, and make sure the path you lead your customers on is easy to follow and flows around the entire store, taking your customers within sight of the majority of your products. Try placing attention-grabbing pieces at the far end of your store so as to attract customers all the way in, and pick out a few products that would work well as impulse buys – these should be fairly small and cheap – and arrange them within easy reach of your till counter. If you have enough space in your store, think about adding seating. Friends, family members and couples often drag each other around shops that only one of them has an interest in – by providing comfortable seating for those who haven’t come to shop, you’ll be buying those who have a little extra time to browse. 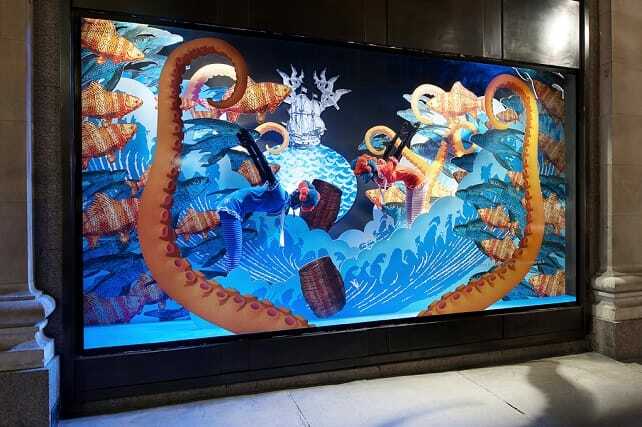 Shop windows are visible at all times, so try to think of them as a free, 24/7 advertisement and aim to get the most out of them. They must be eye-catching, appealing to your target market, and reflective of your branding. Whether your brand aesthetic is minimal or abundant, make sure there’s logic to your composition and ensure the result doesn’t look unappealingly sparse or overly cluttered. Remember, a shop window should display a few representative products in order to entice customers inside to see more of the range – not show off the whole range in one go. Alongside your products, add signage that complements them, advertising information about key products, or prices and special offers – just make sure their wording is legible from a distance. See this as an opportunity to be creative. It doesn’t just have to be products and signage – can you use other objects to create a scene or tableau with your products at the centre? Can you enhance them with things like decorative tables, lighting or framing? Depending on how busy your street gets after hours, you may want to invest in some lights to keep your window display visible overnight. Pricing your products is all about striking a balance. Adopting a particular pricing strategy will give you a structure to follow. In general, you should give customers the sense that what they’re paying is fair – or even good value – but at the same time, don’t undervalue your products – you have to make a profit, after all. If you’re unsure, explore successful retailers in your area who sell similar products to you and take a look at their prices, using these as a reference point for yours. Keep in mind that prices do play a role in how customers perceive your business. If you’re flogging premium items, for example, a slightly higher price mark will work to enforce your image as a premium retailer. On the flip side, you won’t look good if you’re selling products for more than they’re worth. One thing to bear in mind is VAT, which your pricing will have to include. VAT typically sits at 20%, though products such as alcohol, tobacco, fuels, children’s car seats and more have different rates of VAT. If there’s one thing you should not underestimate, it’s the importance of picking a good location in which to open your shop. No matter what you sell, if there aren’t enough customers coming through your doors you aren’t going to succeed. If you’re in the middle of nowhere or difficult to find, for example, you’ll miss out on those customers who’d otherwise spontaneously wander in to see what you’re all about. Learn about the population. Visit the shopping districts and observe the people who frequent them; you’ll want to be in an area with considerable footfall from your target customers. As Hardy says, “make sure you’ve spent a lot of time in the area, both at different times of day and on different days of the week, and pay attention to how busy the streets are and who’s walking them”. For a more accurate picture of the local demographic, try online tools or even meeting with a local estate professional who knows the area back to front. Just be wary that they might charge. Find your competitors. Seek out areas where businesses similar to yours have settled. Is there a particular street where fashion-lovers shop, or a corner of the shopping centre where hungry shoppers know they’ll find a bakery? It may seem counterproductive to open near your competitors, but as they’ll be attracting your ideal customers you’ll want to be nearby – effectively benefitting from their marketing efforts. Just make sure that you have the capacity to compete with them (see Section 9). Consider the cost. Certain areas will be more expensive to lease a property in than others, and unfortunately these are likely to be the busier, more popular hubs. Paying extra may well be worth it to gain access to more customers, but if you decide it’s not, try looking for ‘up-and-coming’ places in your town. These are often cheaper than the established areas of interest but may well see their fair share of trendsetters. Whether these areas are right for you or not will again depend on who tends to shop there, and for what. Check out available properties. Obviously you can’t launch on your dream street if there’s no free space for you on it. Keep this in mind while exploring locations and be wary of the areas that have ideal properties available to you. Services such as Appear Here specialise in helping start-ups locate ideal rentable spaces for their business, so this could be a good place to start. Size. Nobody feels comfortable in a shop where products are spilling off the shelves and customers have to squeeze past each other – so make sure your facility has enough space for you and your product range, both on the shop floor and in the stockroom. Style. Does the architectural design of the building matter to you? Will it have an impact on the way customers perceive your business? Layout. Are you looking for a space that’s long and thin, short and wide, or more of a square? How will your product displays fit in? Are you happy to go up and down staircases to get between your shop floor, stockroom and staff room? Health and safety. You’ll be spending a lot of time in your shop, so you’ll want it to be a liveable environment – and this becomes all the more important when you start to hire staff. Ensure the building has good ventilation, working central heating and air conditioning, suitable lighting and a decent space for a staff room and toilets. First of all, you’ll need to kit out your shop with shelving units, display islands and/or rails that effectively show off your products, as well as a counter over which you can accept payments. There are a number of services that will do this for you. This is another opportunity to explore your business’ branding and get creative. Try looking for different shapes and colours that best fit your brand and products, or have a go at painting the shelves yourself. It’s crucial that you have a till, and – as you’ll find very few people carrying wads of cash around these days – an EPOS system (find out more in our guide to small business EPOS systems). If you want to be as up to date as possible, plump for one that accepts contactless or even mobile payments. To find the right EPOS system, you can simply click this link to compare prices today. That being said, as a shop you’ll likely have wads of cash in the vicinity. Ensure that your till locks up tight and that you have a safe stashed in a hidden location to keep your hard-earned money secure. When it comes to pricing up your products, you’ll need to invest in a label maker to create stickers or a tagging gun and plastic tag attachments to fasten price tags to your products. You’ll also need to stock up on point of sale labelling, such as posters, signage, shelf labels and the price tags themselves. If your shelves stack high against the wall or your stockroom is crammed full to the rafters, expect to buy a stepladder or footstool so that you can safely get things down when needed. You’ll also need a supply of carrier bags in a few sizes that sufficiently fit your products. Use these as a branding exercise and have your shop’s logo and messaging printed on them. For a more environmentally-friendly business (and one that customers are more likely to view as forward-thinking and considerate), opt for biodegradable bags. Of course, the more specific equipment will depend on what you’re selling. A clothes shop, for example, will need a good supply of coat hangers. If you’re launching a café or bakery or something similar, you’ll need specialist equipment for preparing and displaying food and drinks – not to mention tables and chairs for customers to sit at. To make things simpler, you might want to sign up to a service that provides all you need to set up a shop in one place. Companies like Display Centre, Morplan, Shopfitting Warehouse, Equipashop and e-shopfittings, for example, provide bespoke fittings, mannequins, point of sale equipment, carrier bags, cash registers, tagging guns and more. Alternatively, to save a little money you could try buying your equipment second-hand. Doing this can work out a lot cheaper but doesn’t always equate to scrimping on quality. Websites like eBay, preloved.co.uk and Gumtree have been known to post listings for used retail equipment such as till systems. According to Whybro, “you have to consider utilities such as water, gas, electricity, internet, phone, insurance and council services such as waste collection”. You may find it useful to bookmark resources Startups has created to help you in this respect, such as our business energy comparison page and our guide to choosing commercial boilers for heating. It’s vital that you shop around and find suppliers that are right for you. The atmosphere you create in your shop is important – from lighting and temperature to the music you might choose to play – and equally so are the utilities you need to run the business, which may include the internet, telephones and water in the staff room, so be sure to find a supplier that’s affordable and reliable. In order to avoid legal trouble, you must ensure that what you sell complies with the Sale of Goods Act, the Supply of Goods and Services Act and the Sale and Supply of Goods Act. All of these acts are subject to amendments and specific guidelines, so you’ll need to keep up to date with them once you’ve started the business. Carry out a risk assessment, scanning your premises for potential hazards. This could include anything from exposed wiring and wet floors to heavy boxes of stock that could cause back injuries if not lifted properly. Provide any employees with instructions on how to manage or avoid these hazards. Have emergency procedures in place for events like fires or flooding and brief any staff on what to do if such things happen. Install a first aid kit and brief any staff on how to use it. Taylor offers a reminder to also be wary of data usage: “GDPR is a very current piece of legislation that all business will have to deal with in great depth from May 2018. This complete guide to shop insurance has everything you need to know. Public liability insurance – This will cover you in the event that a customer suffers injury, illness or damage as a result of your business and makes a claim against you. Product liability insurance – This will cover you in the event that a customer claims they have suffered a personal injury or property damage as a result of a product you have sold to them. Employers’ liability insurance – If you hire staff, this insurance is a legal requirement and covers claims from employees who suffer injury or illness as a result of working for you. Equipment cover – Items like electronic tills and shelving units can be expensive, so you’ll want to be covered to replace them if yours get damaged or stolen. When you start up your business, it’s likely that you won’t have the funds to hire any staff right away and you may well be happy to hold down the fort on your own. However, as your shop grows and attracts more and more customers, you might feel it’s time to hire someone who can share your workload, or take on the aspects of running the business where your own skill set doesn’t match up to what’s required. Advertising in-store. By sticking notices in-store, you increase your chances of attracting people who shop with you, know your products and feel passionately about your brand. This can make all the difference in terms of how hard they work for you. Posting the vacancy online. Online job boards like Indeed.co.uk are free to advertise on and can get your vacancy seen by plenty of users, while apps such as Job Today specialise in jobs in retail and hospitality. Look for word-of-mouth recommendations. Depending on the intensity of the role and the level of responsibility you’re offering, sales assistant positions can be a good fit for both experienced retail workers and people looking for their first job. You’ll often find an abundance of the latter simply by asking around your friends and family. You could also contact past colleagues and industry contacts to ask for referrals for more senior positions. Timing your offer with term breaks and seasonal periods. Plenty of students look for work over the summer months and Christmas holidays, so timing your offer ahead of these periods may well work in your favour. Decide how much you will pay them. Legally, this must meet or surpass minimum wage, and if you’re based in London you might consider meeting the optional London living wage. Make sure your candidates have the legal right to work in the UK by asking to see a copy of their passport or their National Insurance number. Register as an employer with HM Revenue and Customs. You can do this up to four weeks before you start paying your staff. Check whether you need to automatically enrol your staff into a workplace pension scheme. When it comes to marketing, you’ll need a comprehensive plan in place which outlines your target market and how you plan to reach them – here’s where the marketing section of your business plan comes in handy. The two most important things to consider when planning a marketing strategy are your budget and your target market. Which channels do your intended customers come into contact with, and what can you afford to do with these? What messaging styles do your audience engage with? What do they want to hear from a brand? As McIntosh says, “there’s no point paying thousands of pounds in regional newspaper advertising if your core customer is male and aged 18-24, as they probably won’t engage with this medium. Remember, it’s vital that you monitor and evaluate the results of your marketing efforts so that you can invest more time and budget into the ones that perform and ditch the ones that don’t. Marketing is likely to be a case of trial and error, so don’t be disheartened if your efforts don’t bear fruit immediately. As Whybro says, “given that consumers now need over 20 points of contact with a brand before they commit to buy, an online presence is essential. Similarly, the potential reach to be found through social media cannot be understated, so try all of the platforms (Facebook, Twitter, Instagram and Pinterest) and see which get the most engagement. Hashtags play a big role in helping people to find your posts, so be sure to use popular and relevant ones. Create a hit list of local online influencers – such a bloggers and YouTubers – who have large followings and typically use or review products like yours, then send them free samples of your wares (if possible) for them to try out. A favourable review from them to their fanbase may well mean an instant uplift in interest in your shop. This is a great way to get a good crowd of people into your shop as early as possible. You could hold a launch event where you invite potential customers, local influencers and journalists to explore your shop over drinks and canapes before it officially opens to the public. Building a good relationship with local journalists in particular is key if you want them to be more likely to cover your business in future. Alternatively, you could hold a discount event. Open for a couple of hours at night and invite guests to shop exclusive discounts and deals on your products during this time. If you’re doing this, just make sure that you can afford to offer those discounts. You don’t want to be too limiting in who you invite, but be sure that guests sign up in some way beforehand so that you know how many to expect – adequate preparation is key. This includes advertisements in local newspapers, magazines, radio and television. You don’t want to put out anything that looks sub-par, so don’t rush to pull together a TV ad if you don’t yet have access to the budget or expertise necessary to produce it. An advert in a local magazine or newspaper will be cheaper to put together, but again, it must look professional. If you don’t have much of an eye for design, hire a freelance designer who’ll charge a fixed fee to create it. Taylor advises business owners to “research a few publications… ensure that they have a good readership and target the audience you are intending. Everyone loves a bargain, after all! Just make sure that you advertise your special deals in your window display, on your social media and on any other channels you’re using. You might also want to investigate getting your offers listed on daily deals websites like Groupon, Mighty Deals, Wowcher and more. This will get your business in front of a considerable audience. While this may seem like a long way off, in the future you may find yourself ready to consider an exit strategy. Find a broker or consultant who will represent you and your business well. Take the time to meet with several before signing a deal with one. When it comes to choosing an asking price, research the sales of similar businesses for inspiration. Your price has to be fair, realistic and reflective of market conditions, but don’t under-price it (tempting as this may be if you’re keen to move on). Review the conditions of your lease, both for your property and any equipment you may be renting. Will your buyer be able to simply take it over? Ensure that your finances are up to date. Buyers may want to see these before they commit to purchasing the business as they’ll want evidence that it’s a worthwhile investment to them (or has the potential to be). Have a frank discussion with your employees (if you have any) about why you’re selling the business. Be clear on when it will happen and what they can expect as a result. Be wary of your employees’ rights – it’s important that you don’t breach them. Consider a special sale. This is an excellent opportunity to sell off as many of your products as possible at discounted prices. While you may no longer feel invested in what happens to your business, you should consider it your responsibility to make sure it’s sold to the right person. Ensure they have enough experience and acumen to run and grow it well. Remember, it’s not required of you that you accept the first offer you get. Look into whether you can transfer your VAT registration number to the new owner. Tell HMRC that you’ve sold your business. You can do this via an online form, and this will impact your Self Assessment and National Insurance. You may need to pay capital gains tax on the amount you receive for the sale, but you might be able to claim Entrepreneurs’ Relief to lessen the amount. Learn more about selling a business here. Alternatively, you might decide to turn your brand into a franchise, which effectively means selling instructions on how to open a copy of your shop to entrepreneurs to run themselves. You’ll find great examples of successful retail franchises across the country and in a range of sectors, with famous franchises including Spar, WH Smith, CEX and Build-a-Bear. Franchising is a great way to expand the business without having to dedicate time, effort and money to opening another shop in a new location yourself, with the business owners who launch the new shop footing the bill. Visit our dedicated franchising channel to learn more.